NEW ORLEANS (AP) Andrew Wiggins wouldn’t let fatigue from consecutive games be an excuse for a poor effort by his Minnesota teammates. So he did something about it. 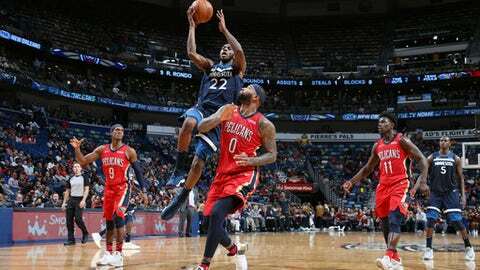 Wiggins scored 28 points to help the Timberwolves beat New Orleans 120-102 on Wednesday night in a game that saw Pelicans forward Anthony Davis ejected for the first time in his career. The turning point of the game came midway through the second quarter. With Minnesota leading 45-43, Davis was called for a technical foul. Fifteen seconds later he picked up his second tech and was ejected for the first time in his six-year NBA career. Minnesota responded by finishing the half on a 17-6 run to take a 62-49 lead into the halftime locker room. Davis finished with 17 points and five rebounds. Davis’ teammate DeMarcus Cousins was frustrated with the call after the game. New Orleans was led by Jrue Holiday, who finished with 27 points. Cousins added 17. Trailing 93-76 at the beginning of the fourth quarter, New Orleans would get as close as 98-88 on a 3-pointer by Holiday with 8:19 left, but the Timberwolves responded by scoring the next six points to push the advantage to 104-88. New Orleans (11-10) started the game hot, opening on a 10-2 run. Two free throws by Wiggins with 1:06 left in the opening quarter tied the game 26-26 and a bucket by Crawford cut the lead to 29-28 at the end of the quarter. Dieng’s 3-pointer to open the second quarter gave Minnesota the lead for good at 31-29 with 11:30 in the first half. Timberwolves: F Newmanja Bjelica missed his fourth consecutive games for the Timberwolves due to a foot sprain. … G Jeff Teague, who leads Minnesota with 7.5 assists per contest was also absent for the fourth consecutive game due to a lingering sore right Achilles. Pelicans: The Pelicans were seeking their 12th victory on the season, a mark that took until Dec. 26th last season to reach. … The 120 points given up by New Orleans marks the ninth time in the last 11 games they have allowed over 100 points in a game. Timberwolves: visits Oklahoma City on Friday. Minnesota has beaten the Thunder by a combined five points in their first two matchups. Pelicans: plays at Utah on Friday. New Orleans was winless in three games last season against the Jazz.